The first Friday of February I had the chance of attending to a Dinosaur Jr. concert in my city, something that was not really on my schedule, but things flew and I could manage to be there, witnessing this band that I don’t actually frequently listen to, but that I like nonetheless. This was a special event called Converse Rubber Tracks, with two shows in two days. The first day was the one with Dinosaur Jr. and another Mexican band whose music was not that nice. For being a special event, and a free event, I thought the band would perform a short concert, but hell, I was completely wrong. 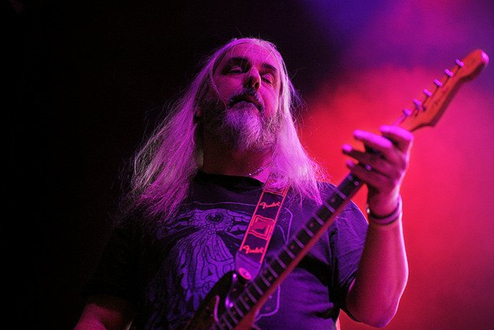 It was a Friday night in my nowadays favorite venue (El Plaza Condesa), full of people eagerly waiting for a fantastic rock show, when J Mascis and co. came out to stage, making us scream and get ready for a superb evening. They started with their classic “Forget the Swan” the first track off their first album; of course, it was quite a powerful way of starting the show. I’ll be honest, I am not a Dinosaur Jr. connoisseur, in fact, I only recognize like three or four songs, in spite I have listened to their albums, they have never matched with me in order to consider them as a favorite, no, but they greatly surprised me in the concert, it did not matter I didn’t know the songs, it was enough for me to listen to great music with three musicians whose good vibes and spirit made us vibrate, jump and be completely entertained. So the show continued, bringing us great moments with 4-5 minute songs in the vein of alternative rock, grunge and hard rock. The band was enjoying the show, I believe they were happy to see a full venue, and that most of us were excited listening to their sounds. Some other songs performed were “No Bones”, “In a Jar”, “Feel the Pain”, “Start Choppin”, “Freak Scene”, “Kracked” and “Sludgefeast”; with the last one, they finished the main set and left the stage. Of course, after a minute of applauses, they returned and gave us two more songs. First it was “Budge”, the last Dinosaur Jr. song that produced a lot of smiles in the audience, and then “Just Like Heaven”, yes, that famous The Cure song. With it, the concert finished and we left really satisfied of having witnessed an excellent performance from this US rockers.